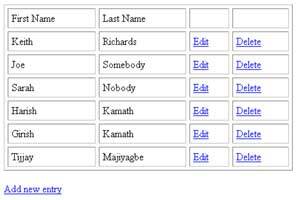 Use PHP's LDAP API to write complex search queries and modify the LDAP directory tree. In the first part of this article, I gave you a crash course in the basics of using PHP with LDAP, demonstrating how PHP's built-in support for LDAP makes it easy to query an LDAP directory server for user information. That article also included a detailed discussion of the steps that make up a PHP-to-LDAP session, together with examples demonstrating how those steps play out in the real world. In this second (and concluding) article, I will carry the torch onwards, explaining how to perform more complex searches with LDAP. Since PHP comes with a whole bunch of functions for updating LDAP directory servers, I'll also examine those, with examples of how they can be used to add, modify and delete entries to the LDAP directory tree. Let's get going! Let's suppose I want to search for my friend Joe from high school. Now, there are a million Joes in the world, and I would like to drill down to my Joe without having to navigate through a large set of results. The solution? A more complex search, which uses additional parameters to restrict the result set. This search string, obviously with the variables replaced with actual values, is passed to the ldap_search() function; it returns only those entries from the LDAP directory free which match all the parameters specified. Why? Because of my usage of the special AND operator, signified by the addition of the ampersand (&) to the beginning of the search string above. 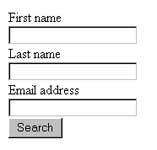 If your LDAP entries contain other attributes, it's just as easy to create more complex search queries - simply add more input fields to the search form, and update the search string above to use those attributes when searching the directory tree. In case you were wondering, yes, you can also use logical OR (the | operator) or logical NOT (the ! operator) in your search queries - I'll leave that to you to play with. So that takes care of searching. Now, how about adding, editing and deleting entries? PHP comes with a full-fledged API that allows easy modification of the LDAP directory tree. In order to demonstrate how this API works, I'm going to build, over the next few pages, a simple administration module that performs these functions, so that you can see how it's done. As you can see, most of this code is similar to what you saw in the previous article. However, there is one important difference - instead of using the ldap_search() function, I'm using the ldap_list() function, which returns a one-level list of all the entries matching the specified criteria, given a base DN at which to start searching. This base DN and search filter are provided to ldap_list() as second and third arguments respectively. In the example above, the ldap_list() function returns all the entries which have a "cn" attribute and are located immediately under the node with DN "dc=my-domain,dc=com". Additionally, ldap_list() accepts a fourth, optional parameter - an array containing a list of all the attributes that should be included in the result set. In the example above, this array is called $params, and it specifies that the returned result set should contain the "cn", "sn" and "mail" attributes. The search result identifier returned by the ldap_list() can be passed to the ldap_get_entries() function, which does the dirty work of extracting the raw data into a structured array. This array can be processed using a simple "for" loop. Note also the links to "edit.php" and "delete.php" next to each entry - I'll be discussing the scripts these links point to shortly. For the moment, though, skip downwards to the last link on the page, which points to "add.html" - this is the HTML form that is used to add new users to the database, and it's discussed on the next page. Now that you know how to pull data out from the LDAP directory, how about putting some in? PHP has a function to do this as well - I'll show you how to use it, by creating a simple interface to add instances of the "inetOrgPerson" class to the LDAP directory. You'll notice here that I've only used three attributes of the "inetOrgPerson" class - "cn" for the common name, "sn" for the surname and "mail" for the email address. Feel free to add to this list if you like. In order to add an entry to the LDAP server, you must provide the server with appropriate credentials - something I've obviously not done in the example above. Typically, these credentials consist of the superuser's DN and password - information that you should have set when setting up your LDAP server. Assuming you have this information, let's modify the code above and give it to the LDAP server. Note the addition of user credentials in the call to ldap_bind() - these credentials will be used to authenticate the PHP client and allow it to make changes to the LDAP directory. Note also that LDAP requires you to provide the complete DN of the superuser, not just the username (as is common with other authentication mechanisms). Once that's taken care of, the next step is to create an associative array whose keys correspond to attributes of an LDAP entry. The data for these attributes is obtained from the HTML form submitted by the user. Once that's done, I also need to construct the DN for the new entry. 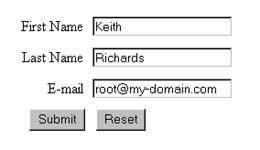 In this case, I've used the email address as a component of the entry's DN in order to ensure uniqueness (LDAP DNs at the same level in the hierarchy must be unique). In case you're wondering where all this is going, you should know that all this information is needed by the ldap_add() functions, which is the PHP function that actually takes care of adding a new entry to the LDAP directory. This functions requires three arguments: a link identifier for the LDAP connection, the DN for the new entry, and the actual attributes of the entry. Since I now have all this in place, all that remains is to call ldap_add() and save the data to the LDAP server. In case you're wondering about the numerous calls to ldap_error() in the code above, ignore them for the moment - I'll be explaining them in detail shortly. This code listing is similar to the code for adding a new user...with one important change: it uses the ldap_modify() function instead of the ldap_add() command to update an existing entry, rather than add a new one. So that takes care of listing, adding and modifying entries. All that's left is to delete entries. Again, this is similar to modifying entries - "delete.php", the script to invoke entry deletion is accessed from the main index page, and is passed the user's email address using the URL GET method. This email address is then used by the PHP script to identify the corresponding entry and remove it via the ldap_delete() command. You might remember, from the scripts in this article, my copious use of the ldap_error() and ldap_errno() functions. As you must have guessed by now, these are built-in API functions to record and display error messages. The ldap_errno() function returns a pre-defined error number for each LDAP error. While this number is, by itself, not very useful, it acquires significance when coupled with yet another PHP function, ldap_err2str(), which returns a user-friendly error message for display to the user. And that's about it for the moment. In this concluding article, I delved further into the PHP API for LDAP, demonstrating the PHP functions that let you retrieve and modify data in the LDAP directory tree. After a brief detour to demonstrate how you can easily build search forms for complex LDAP queries, I took you through the process of building a Web-based administration module for an LDAP directory, demonstrating the PHP API calls that allow you to add new entries to, and modify and delete existing entries from, the LDAP server. I also took a brief look at PHP's error-handling capabilities in the LDAP world, demonstrating the two PHP functions that can be used to trap and gracefully handle errors in your PHP-LDAP scripts. Obviously, this is just the beginning - LDAP has a whole bunch of different applications, and PHP is well-suited to all of them. The synergy between the two technologies cannot be overemphasized, and, as the LDAP API in PHP evolves, you can expect to see more and more applications building on this synergy. This article was first published on 04 Apr 2003.